For Macworld editors, the end of the calendar year means more than just holiday vacations and the passing of yet another end-of-the-world prediction. It’s also the season of awards. Over the past couple weeks, we’ve given you our 2012 Editors’ Choice Awards for the best Mac products of the year and our 2012 App Gems Awards for the best iOS apps of the year. Here at Mac Gems HQ, we have no official awards with fancy trophies, but I look back and pick my favorite Mac Gems of the previous 12 months—the best inexpensive-but-good apps we covered over the just-completed year. Unlike the Eddies and the App Gems Awards, the “Mac Gems of the Year,” if you will, aren’t chosen by committee. Rather, I hand-pick them from among the over 100 Gems we mined at Macworld during 2012. (To qualify for Mac Gems, a product must be priced at $35 or less and must earn a 3.5-mouse rating or higher.) The ones recognized here aren’t necessarily the Mac Gems that earned the highest ratings from our reviewers. Instead, they’re the apps that I felt did something innovative; offered exceptional value; improved productivity above and beyond other apps; or ended up being used—by me or a fellow Macworld editor—over and over. These inexpensive applications and add-ons will help you get the most out of your Mac without blowing your budget. Of the 100+ other Gems we reviewed this past year, these 11 also counted among my dozen favorites. Bartender ( ; $15; website): As more and more apps and utilities offer options for, or are accessible only via, systemwide menu-bar icons, the right side of the menu bar has grown ever more crowded. Bartender comes to the rescue by giving you a secondary bar—one that appears just below the menu bar and only when you want it to—for hosting menus that you don’t need to see all the time. (You can show Bartender’s bar by using the pointer or a keyboard shortcut.) If a particular menu displays information, you can configure Bartender to show that menu briefly each time it updates, and then hide it until the next update. Bartender lets you rearrange all of the systemwide menu icons, not just the stock OS X ones, and you can hide the Notification Center and Spotlight menu icons without losing access to those features. Clarify ( ; $30): If you ever need to create how-to documentation or instructions, Clarify makes it easy to take a sequence of screenshots and turn them into an annotated document. Clarify is dramatically superior to Word, Pages, or TextEdit for creating comparable images and documents: It's easier, it's faster, and it produces better-looking results. Fission 2 ( ; $32; website): This big update to Rogue Amoeba’s easy-to-use, lossless audio editor makes it simpler than ever to trim songs, splice tracks, tweak voice recordings, fade tracks in or out, and create ringtones without altering the quality of the original file. Compared to version 1, Fission 2 offers an improved interface; better performance; support for FLAC; and conversion to and from AAC, MP3, AIFF, WAV, FLAC, and Apple Lossless formats. It also lets you open multiple editing windows simultaneously, it can save enhanced (chapterized) AAC files for podcasting, and it offers instant uploading to SoundCloud. FreeSpace ( ; $1): An early version of this menu-bar utility received an honorable mention in last year’s list of favorite Gems; but thanks to a number of recent updates, it has earned a solid place on my 2012 list. FreeSpace’s systemwide menu shows all mounted volumes along with the available free space on each; if you want to monitor a particular volume, you can choose to have that volume’s free space displayed right in the menu bar. FreeSpace also makes it easy to open or eject any volume—features I use dozens of times each day—and the utility can notify you whenever any volume’s free space drops below a specified threshold. Hazel 3 ( ; $25; website): Dan Miller first reviewed Hazel 2 back in 2010, but Hazel 3 really impressed him. For users still wedded to the file-and-folder approach to organizing data, Hazel 3 helps automate many tedious tasks associated with putting stuff where they ultimately want it to go. The utility monitors folders on your events for events that you've defined—such as the addition or modification of a file—and then automatically performs actions that you’ve chosen, such as moving the file to another folder, renaming it, or changing its label. Hazel 3 offers nested conditions, interface improvements, new criteria for matching (including AppleScript and shell-script results, additional file attributes, and the current time), better tools for matching patterns, and a number of new actions. Lion DiskMaker ( ; payment requested; website): I first covered this little AppleScript-based utility back in May, before the release of OS X 10.8 Mountain Lion. At the time, it offered a simple way to make a bootable Lion (OS X 10.7) install drive from the original Lion installer. Since then, Lion DiskMaker has received a number of updates, and it can now make a bootable Mountain Lion install drive from the Mountain Lion installer. It’s also gained a cleaner interface, a new progress bar, improved compatibility with various OS X installer packages and disk images, and better support for DVDs (for those who, against all advice, insist on creating a bootable installer DVD). The interface still feels a bit clunky, but for sheer usefulness—the number of people who’ve used our bootable-installer articles is flabbergasting, so clearly there’s demand for this type of utility—Lion DiskMaker stands out. Little Snitch 3 ( ; $35; website): Another update to a previous Gem, Snitch 3 offers enough significant improvements to merit inclusion on my list. Like its predecessor, Snitch 3 alerts you to outgoing network connections (noting the app or process that is requesting network access, and the server and port that the app is attempting to contact), so you can approve or deny each one on a one-time, time-constrained, or perpetual basis. This feature is useful for detecting malware, as well as for seeing which apps are accessing the network for more than their stated purpose. Version 3 adds an improved network monitor and, most significantly, the ability to monitor inbound network requests, making it a full-fledged firewall with an interface that doesn’t require certification in firewall administration. MailTags 3 ( ; $30; website): If you use Mail a lot, MailTags can dramatically improve your email productivity. This Mail add-on lets you assign tags (keywords) to individual messages; you can use those tags in searches and with rules to find filed mail and to process incoming messages more easily. MailTags also lets you assign project names, colors, priorities, and reminders to any email message, and you can even attach notes to messages. Most significantly, MailTags integrates elegantly with Mail—once it’s installed, you forget that its features aren’t just a normal part of Mail. Marked ( ; $4; website): Marked is designed for people who do a lot of writing in Markdown or HTML/XML formats. Open a document in Marked while you’re composing your code in your favorite editor, and Marked will show an HTML-rendered preview of the document that gets updated every time you save—you never have to wonder how your document will look when published. Marked can even take advantage of CSS templates, so your preview looks much as it will on the target website. Marked also provides useful document statistics and readability metrics, along with a nifty visual-highlighting feature that helps you avoid word repetition. When you’re done writing, you can quickly copy the document’s generated HTML code or rendered rich text for pasting elsewhere. I loved Marked when I reviewed it early in 2012, and a subsequent major update has added a bunch of useful new features, including automatic scrolling to the most-recent edit point, HTML-source view with syntax highlighting, and enhanced Scrivener support. Marked is a niche app, but it’s my niche: These days, I have a difficult time writing without a Marked preview open. Pacifist ( ): A Mac Gem way back in 2004, Pacifist got a big update this year. The revised utility lets you view the contents of OS X installer packages (.pkg and .mpkg files), and it lets you verify installations and even extract or install any file from within a package. New in version 3.1 are support for disk images and file archives, the ability to work with remotely stored packages, installer-receipt creation and searching, kernel-extension reports, and a Quick Look plug-in. Pacifist can be dangerous if you don’t use it carefully, but it can also be incredibly useful, especially for troubleshooting. There’s nothing else like it. A few other Gems didn’t quite make the “favorites” cut but are still worth calling out. 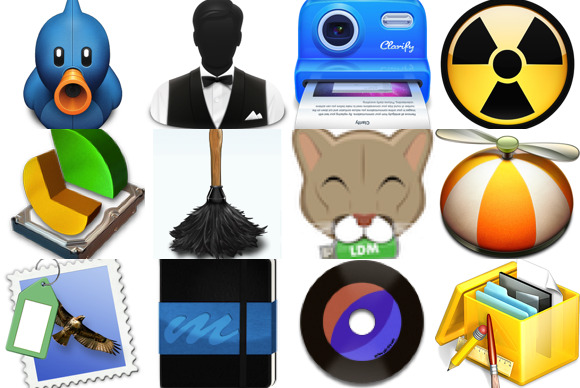 Various Macworld editors use these apps every day. Display Menu ( ; free; Mac App Store link): Designed for non-Retina Macs, this simple utility brings back the systemwide display-resolution menu that OS X 10.8 Mountain Lion eliminated. Admittedly, it wouldn’t have earned even an honorable mention here if Apple hadn’t removed a useful feature from OS X, but if the number of readers who requested a replacement for that feature is any indication, this was one of the most popular Gems of the year. Due ( ; $10; website): Phocus’s Due for iOS is a nifty timer/reminder app, and the company successfully brought the app to the Mac in 2012. Due for Mac retains the simplicity of the original app while effectively transitioning to the Mac’s point-and-click environment. PopClip ( ; $5; website): This utility brings iOS’s text-processing popovers to OS X: Select some text, and you get options for working with that text. Depending on the app and context, options may include searching the Web for or defining the selected word or text; copying or pasting; checking spelling; (in the case of email addresses) sending an email message; or (for Web URLs) opening your browser. Since my original review, PopClip has added support for extensions that let you perform many more—and more-complex—actions on selected text. QuickRes ( ; free; website): Like Display Menu, QuickRes gives you a systemwide menu for switching your display resolution. But QuickRes is optimized for Retina-display Macs, as it lets you choose any resolution that your Retina display supports—even the super-high-res native resolutions that the Displays pane of System Preferences doesn’t offer as options. You can also designate your favorite resolutions and then cycle through them with a keyboard shortcut or mouse click. Looking for more of the best affordable Mac software? Check out the best Gems of 2011 and the best Gems of 2010. You can also browse some of our older Gems lists: 2010’s 10 must-install Gems, the 2009 list of all-time faves, the 2009 list of Gems I’m thankful for and the 2010 follow-up list of more Gems I’m thankful for. You can also follow Mac Gems on Twitter.